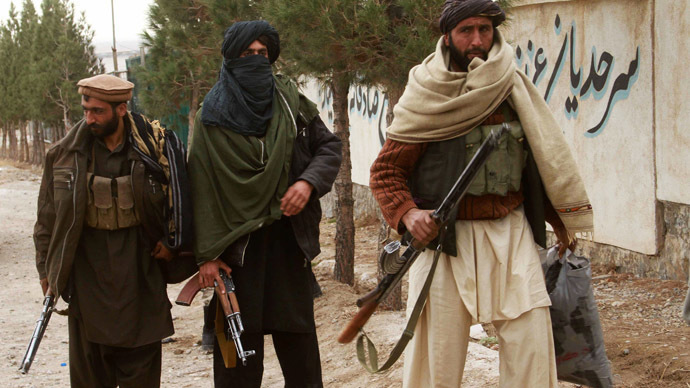 The Taliban says it has been left with no alternative but to continue its fight against the US. They made the statement hours after President Barack Obama delayed withdrawing American troops, saying the US would stay in Afghanistan until the end of 2015. The announcement from the Taliban came from spokesman Zabihullah Mujaahid, who said that the decision by President Obama to leave 9,800 US troops in Afghanistan was not going to do anything to help a resurgent Taliban continue peace talks with the Afghan government. "Obama's announcement to continue to keep troops in Afghanistan is a response to the peace efforts," Mujahid told AFP. "This damages all the prospects for peace. This means the war will go on until they are defeated," he added. The Taliban were incensed by a decision by President Obama to leave US troops in Afghanistan through 2015. He was planning to cut the number of troops from the current 9,800 to 5,000 by the end of this year, withdrawing completely by the end of 2016. However, Obama has since backtracked, and with the blessing of Afghan President Ashraf Ghani, has decided to keep US forces in the Central Asian nation for longer. The US president has still stated that he intends to honor the country’s proposed pullout at the end of 2016. "The date for us to have completed our drawdown will not change," he said, according to Reuters. "Providing this additional timeframe during this fighting season for us to be able to help the Afghan security forces succeed is well worth it." Since being elected to power in September 2014, Afghan President Ashraf Ghani has tried to initiate a peace process with the Taliban, to try and end their 13-year campaign against the Afghan government and its foreign backers – primarily the US. President Ghani is currently on a visit to Washington, and he met with US Secretary of State John Kerry on Monday. During their meeting, Kerry said the US was fully committed to Afghanistan and it would show the Taliban that Washington was “prepared for the long-term to support our friends,” while also adding that he hoped it would encourage peace talks with the Taliban. However, Matthew Hoh, a former State Department official, says the US has little interest in helping the long term development of the whole of Afghanistan and the billions of dollars Washington is providing, is used by the Afghan government to help them stay in power. “It’s only going to help the security of city of Kabul and keep the city safe and in the hands of the Afghan government. It will also allow the Afghan government to have a presence in the big centers, where there are US troops who will provide them with security,” he said. “American money and other nations who pump billions of dollars into the Afghan economy allows for Ashraf Ghani, just as his predecessor Mohammad Karsi did, to run a patronage network, a kleptocracy that is founded on corruption and ill-gotten wealth that allows them to keep themselves in power,” Hoh concluded. However, 2014 was the bloodiest year in Afghanistan since the UN began compiling figures in 2009. A report published by the United Nations in February revealed 3,699 civilians were killed in Afghanistan in 2014, which is a rise of 730 from the previous year. Perhaps more worryingly, there has been an increase every year in the number of civilian deaths since 2009, figures from the UN report show. Armed confrontations between militants and security forces in Afghanistan have also intensified in recent years, as the number of Taliban fighters has skyrocketed from 2,000 to around 60,000, since the US-led invasion in 2001. In 2014 Afghanistan lost over 5,000 police and soldiers who were killed fighting the Taliban, which is more than in any previous year. “I don't think it's possible to find peace in Afghanistan without actually sitting down with insurgents, with the Taliban, to negotiate a peace process. More than a decade of the US war in Afghanistan has been a complete failure, the US has deployed tens of thousands of troops and still haven't been able to put down this insurgency,” Theo Sitther, of the Peacebuilding Policy Friends Committee on National Legislation, told RT. With NATO ending their combat mission in Afghanistan at the end of December, the Taliban declared victory in the protracted civil war. “America, its invading allies... along with all international arrogant organizations have been handed a clear-cut defeat in this lopsided war,” claimed the Taliban, which ruled Afghanistan from 1996 to 2001.